The latest Global Economic Prospects report, issued by World Bank anticipates India will achieve 6.7 percent growth in 2016 and 6.5 percent growth in 2017. As a developing nation, the country imports most of its energy in the form of fossil fuels such as coal, oil and gas from other countries. The country, growing exponentially is looking forward to augment its installed power generation capabilities in the coming years. The increase in power demand is expected to make India the second biggest power consumer after China in 2035. Presently, India is placed behind China and the USA as the biggest emitter of greenhouse gases. But, the Indian Government is taking steps to cut down emission intensity of the country by 33% to 35% below its 2005 levels before the year 2030. In its INDC submitted during the recent COP21 global meet, the country unveiled its plans to augment its renewable power generation capabilities to 40% of the total installed power generation (non-fossil fuels) by the year 2030. 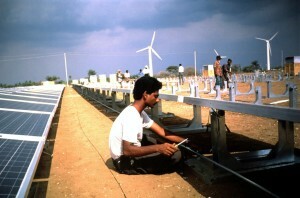 A ground-mounted 100 kW photovoltaic system for installation at a NEPC-Micon Wind Farm site south of Coimbatore, India. For this system Ascension Technology is developing Earth-Jack (trademark) array-mounting hardware based on previous designs used on building rooftops. The entire system is designed to ship in two- forty-foot ISO sea containers and to be field deployed in one week. India, ideally situated in a tropical geographical location, is advantageously placed, to generate more solar power. Most parts of the country enjoys roughly 300 sunny days or almost 1500 to 2000 sunny hours in a year. With an estimated 4-7 kWh solar radiation per square metre, the country is projected to generate around 5,000 trillion kWh per year by installing solar panels over its unused barren lands. 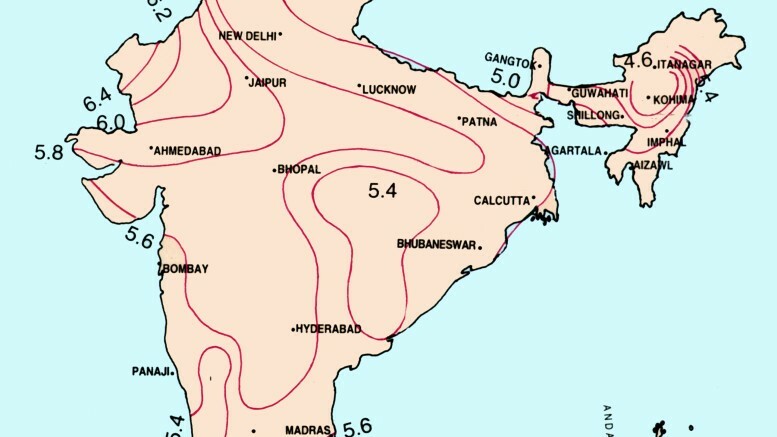 Understanding this potential the Indian government has revised its National Solar Mission target of Grid Connected Solar Power projects to 100 GW by 2022 from the original projection of 20 GW. A white paper produced by CRISIL and PHD Chamber talks about the notable increase in Indian solar installation in recent years. It finds the progressive government policies such as The Jawaharlal Nehru National Solar Mission (JNNSM) and Gujarat’s solar policy has contributed for most of the growth. The paper observes viability gap funding by JNNSM during the phase 1 and two, bid-based tariff calculation, development of infrastructures such as land, road and grid connectivity as main causes for the growth. It is estimated that over five acres of land is needed for the installation of solar panels to generate 1 MW power. In order to achieve the aimed 100GW solar power generation, over five lakh (500,000) acres of land is needed exclusively to install solar panels. The Indian farmland holding and land ceiling laws makes it impracticable to buy more than 21.85 hectares of dry land from a single person. The Indian engineering, procurement and construction (EPC) companies engaged in the development of solar power farms encounter problems in buying large chunk of land at a single location. The government is trying to address the problem by building plug-and-play type of solar parks to offer the land needed for installation of solar panels and grid connectivity to transfer the generated power. According to the Central Electricity Authority’s (CEA), the Indian power sector suffers nearly 23.4 percent transmission and distribution loss and it is estimated to be nearly 40 percent in the case of solar power generation. For the purpose of cutting down this loss to 18 percent, the government recently set up Restructured-Accelerated Power Development and Reforms Program (R-APDRP) to improve the distribution segment. The subsidy structure created to boost solar installations in India continues to remain complex involving a good number of agencies. The failure to have proper policy mechanisms to check the meeting of Renewable Power purchase Obligations by the state electricity regulatory commissions (SERCs) is the biggest problem for the solar power producers. Also the non-extending of fixed prices for the Renewable Energy Certificates (REC) program beyond 2017 failed to attract the investors. The nonstop innovations make solar technology costs come down at regular intervals. Yet the solar power generation costs are not on par with the grid tariff, thus making it difficult for the power producers to sell the generated power. The government is taking steps to address this problem by extending financial support and incentives to the solar power producers. The present Indian government is planning to give a big push to the torpid solar power generation. It is trying to do away with the complex policies that hamper the growth of solar power generation. Though the 100 GW solar power generation by the year 2022 may be little far-fetched, even generating 40GW to 60 GW power will help the country to achieve a steady growth. Be the first to comment on "Special Report: Solar Energy in India"